Dr Choedrak Visits the U.S.
You may listen to Dr. Choedrak chanting the Medicine Buddha Mantra as you read this page. You will need Windows Media Player. You can set the "play" option to "repeat" to play the mantra continuously. For the first time in history, the 14th Dalai Lama of Tibet has sent his personal physician on tour to the United States in hopes of creating interest in the ancient Tibetan medical system and in raising awareness of the medical needs of his exiled countrymen in India. 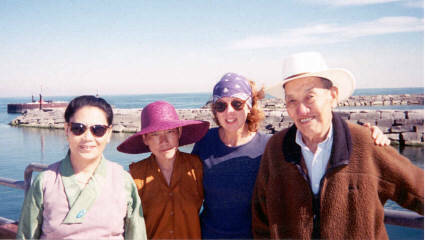 Traveling on an eight city tour with two other doctors and an astrologer from the Tibetan Medical and Astrological Institute, Dr. Tenzin Choedrak hopes to create some interest and understanding of the rapidly disappearing science and art of Tibetan medicine, and also solicit support for the clinics and hospitals which have been established by the Tibetan government in exile. The doctors will be traveling with an exhibit of medical paintings, classical medical texts, hand painted astrological diagrams, and various herbal and mineral substances that are used in the traditional practices of Tibet. In addition, there will be a sale of books on Tibetan medicine and astrology, lunar and solar Tibetan calendars, traditional incense formulations, and decorative postcards and posters. A limited number of cassette recordings of the presentations are available: call (440) 461-7488 for prices and availablity. All profits will be sent to T.M.A.I. Saturday February 15 , 1997: The Cleveland Museum of Natural History, Wade Oval, University Circle, Ohio 44106. Exhibit will open at 6 p.m. Lecture will begin at 8 p.m. Dr. Choedrak will speak on " Ways of Keeping a Healthy Body and Mind Using Tibetan Medicine" . The medical astrologer will speak on " The Relationship between Tibetan Astrology and Tibetan Medicine" . For more information, contact the Cleveland Museum of Natural History at (216) 231-4600. Sunday February 16, 1997: Sponsored by the Association for Holistic Health at the Meridia Medical Center at Sagamore Hills, 885 West Aurora Road on Route 82 between I-271 and I-77. Exhibit will open at 2 p.m. with a talk by Dr. Choedrak at 4 p.m. on " The Three Unwholesome Behavioral Patterns and their Effect on the Dynamic Disharmony of the Three Principal Energies of the Body", followed by a talk by the medical astrologer on the relationship between "Astrology and Medicine". For further information, contact the Association for Holistic Health at (216) 491-0333. Thursday Feb 20, 1997: Cleveland Buddhist Temple 1573 E 214 Street, Cleveland, Ohio 44117. Exhibit will open at 5 p.m. Talk by Dr. Choedrak and Dr. Dawa at 7 p.m. " Basic principles of Tibetan medicine: principle of normal healthy and unhealthy body; the three unwholesome behavioral patterns and their effect on the dynamic harmony of the three principal energies". Mrs. Choezom will then speak on the Relationship between "Tibetan Astrology and Tibetan Medicine". Saturday Feb 22 , 1997: Sponsored by Jewel Heart at Christ Church 3445 Warrensville Center Road, Shaker Heights, Ohio 44122. 11 am Dr Choedrak and Dr. Dawa will speak on " Overcoming Mental and Spiritual Obstacles through Spiritual Practice" followed by Mrs. Choezom speaking on " Astrology in the Tibetan Community". Evening Talk: Exhibit will open at 6 p.m. There will be an 8 p.m. Talk by Dr. Choedrak on " Tibetan Medicine for Mental and Physical Health" . Dr. Dawa speaks on "Tibetan Medicinal Plants". The medical astrologer will then speak on " Introduction to Tibetan Horoscope and the Marriage Chart" . For further information contact Jewel Heart at (216) 556-4858. Thursday January 30, 1997: Clinical Sciences Noon option; " Introduction to the Tibetan Medical System" by L.B. Grotte M.D. University Hospitals of Cleveland. Ground floor at Bolwell. Tuesday February 18, 1997: Clinical Sciences Noon option. " Ways of Keeping a Healthy Body and Mind Based on Tibetan Buddhism and Medical System" University Hospitals of Cleveland. Ground floor at Bolwell. 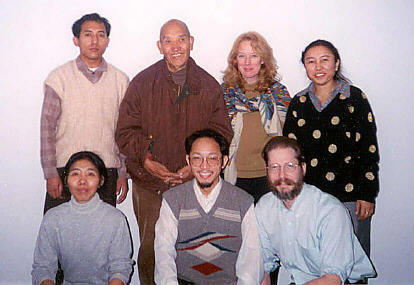 Tuesday February 18, 1997: "Teaching Compassion in Medicine: 1200 Years of Tibetan Wisdom-Practice: A Presentation by Dr. Tenzin Choedrak, personal physician to the 14 Dalai Lama". 7:00 p.m. Tuesday February 18, 1997: Rainbow Baby's and Children' s Hospital Auditorium. Wednesday February 19, 1997: Meeting with Family Practice Psychosocial group at Metro-Highland View Hospital. "Methods of Treatment in Tibetan Medicine--Medicine, Religious Meditation, and Behavior on Food and Drinks". Mrs. Choezom will give an "Introduction to Medical Astrology". 10:00 a.m. at Metro-Highland View. Friday February 21, 1997 1:00 to 3:00 p.m.: "Ethical Dilemmas in Living and Dying: The Tibetan Buddhist Perspective" CWRU School of Medicine BRB auditorium. A joint presentation by Dr. Choedrak and Gelek Rinpoche. Rinpoche and Dr. Choedrak will discuss the ethical system of Tibetan medicine and detail the unique application of this Asian medical system to issues surrounding suffering and the end of life. The role of the physician and lama in the care of the dying patient will also be addressed. This course will be sponsored by Case Western Reserve University School of Medicine and will cost $20.00 for physicians, nurses, and social workers. No charge for students. This meeting qualifies for 2.5 Category 1 credit hours of the Physicians's Recognition Award of the American Medical Association.